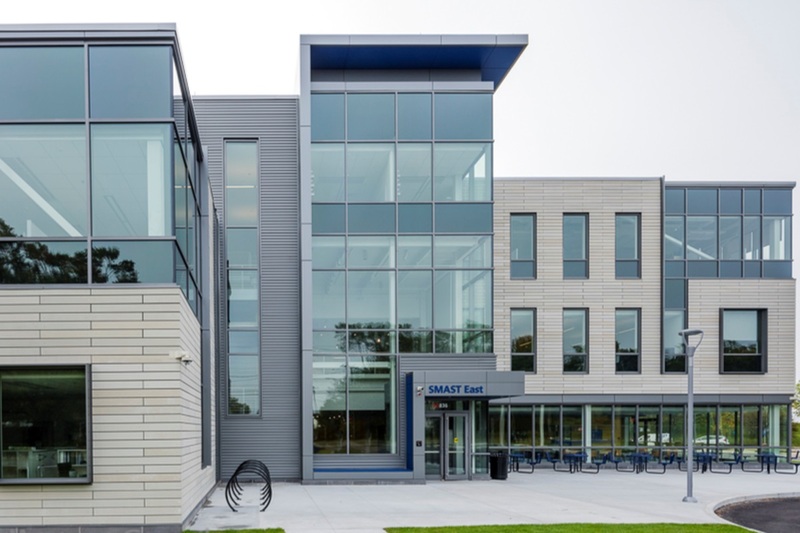 (Boston, MA) – BOND, the Northeast’s premier building, civil, utility and energy construction firm, celebrated the opening of the new University of Massachusetts Dartmouth School for Marine Science and Technology (SMAST). A ribbon cutting ceremony was attended by members of the University, BOND executives, the project team and several dignitaries including: Robert E. Johnson, Chancellor of UMass Dartmouth; Martin T. Meehan, President of UMass; William R. Keating, U.S. Representative; Mark C. Montigny, State Senator; Antonio F. D. Cabral, State Representative; Jon F. Mitchell, Mayor; and Patricia A. Filippone, Executive Director, University of Massachusetts Building Authority. Located in New Bedford, Massachusetts, the new 64,500 square foot facility supports the largest marine science program in the UMass system. It features state-of-the-art laboratory facilities with marine and wave tanks and a seawater research facility. Expanded space for the Massachusetts Division of Marine Fisheries (DMF) and dive gear program is also housed within the building. This new facility brings together faculty, students and the DMF community to engage in education, research and policy related to commercial fishing, coastal preservation, ocean observation and climate change. BOND worked closely with architect, Ellenzweig; project manager, Hill International; DCAMM, UMBA and UMass Dartmouth to provide preconstruction and construction management services for the project. The new building consolidates the marine science program of the University into a comprehensive LEED Silver certified facility. The building opened on time for the Fall 2017 semester.